Nordson® Corporation introduced the VersaBlue® Plus melters with optional pattern placement and material flow monitoring and control at last month’s INDEX 2014 in Geneva, Switzerland. Incorporation of monitoring and control into the melter simplifies installation into the production process, as well as provides ease-of-use of these functions through the VersaBlue melter’s graphical, touch screen interface. 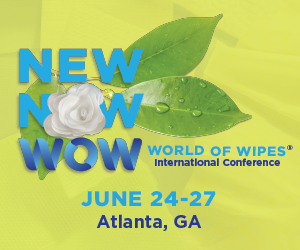 Utilization of these expanded optional capabilities helps disposable hygiene product manufacturers produce higher-quality products faster, more efficiently and at lower cost. Optional melter-integrated flow monitoring and control for up to four (4) channels for continuous or intermittent dispensing applications is an addition to the existing full-feature set that VersaBlue melters have delivered for more than a decade. Integrated closed-loop control continuously measures and compares the material flow rate to the application’s flow requirement, automatically adjusting material delivery in real-time to minimize the difference between the requirement and actual flow rates. VersaBlue Plus melters also offer optional integrated closed-loop pattern control for up to eight (8) channels for intermittent dispensing applications. This functionality compensates for possible pattern drift over time, particularly in demanding, high-speed intermittent applications. Additionally, module response monitoring of up to thirty-two (32) channels verifies correct adhesive placement while enabling predictive maintenance and extending service life. The VersaBlue melter’s intuitive, easy-to-use graphical touch screen interface simplifies set-up and operation of pattern and flow control, in addition to providing system status for various melter functions. Basic pattern and flow monitoring and control reporting are available on the melter display, or more detailed pattern and flow information can be exported to a laptop or via field bus. 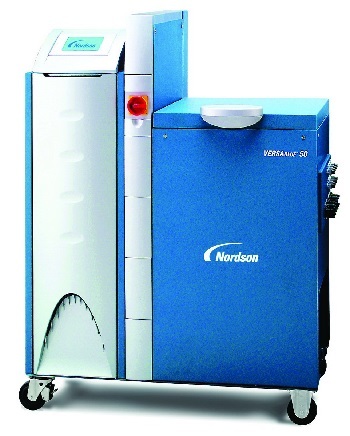 For more information on VersaBlue Plus melters, or any of Nordson’s OptiBond™ solutions for nonwovens product manufacturing, contact Nordson Corporation at (800) 683-2314 or visit www.nordson.com/nonwovens.